We been having a heat wave over here and I'm not not complaining. I love summer that much! Whenever I feel like I'm going to start to complain about it being too hot I just get flashes of shoveling my car in snow and it's not a pleasant thought. I choose this heat anytime over that. To beat the heat I like to dress light and simple. For this look I paired a floral crop top with a flowy skirt. This is one of my favorite crop tops. 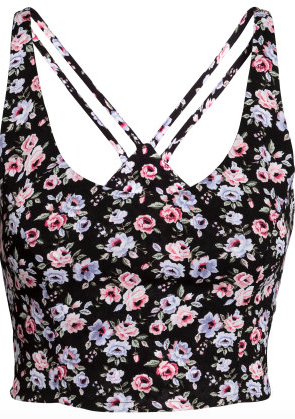 I love the floral print and how light weight it is for hot days like the ones we been having recently. The pink skirt made the florals stand out even more making this a perfect summer outfit. I kept the accessories to a minimal and just added a initial pendant necklace from Shopprimadonna. I wore this outfit on Sunday which was #NationalIceCreamDay and of course two scoops of heaven on a waffle cone followed immediately after I took these pics! I love the skirt. The color is super beautiful!! !